I want to take a moment here to shamelessly plug KQED's Education Network, which creates curriculum and education guides for teachers. For example, educators can use the information and research conducted by Quest to teach students about The Great Migration with this handy PDF. For thousands of years and countless generations, migratory birds have flown the same long-distance paths between their breeding and feeding grounds. Understanding the routes these birds take, called “flyways,” helps conservation efforts and gives scientists better knowledge of global changes, both natural and man-made. 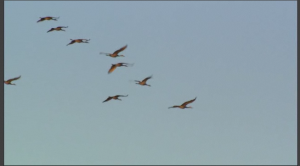 QUEST heads out to the Pacific Flyway with California biologists to track the rhythm of migration. The PDF includes a list of useful facts, lesson plans, questions to answer with students, and multiple resources for further research. Check it out!